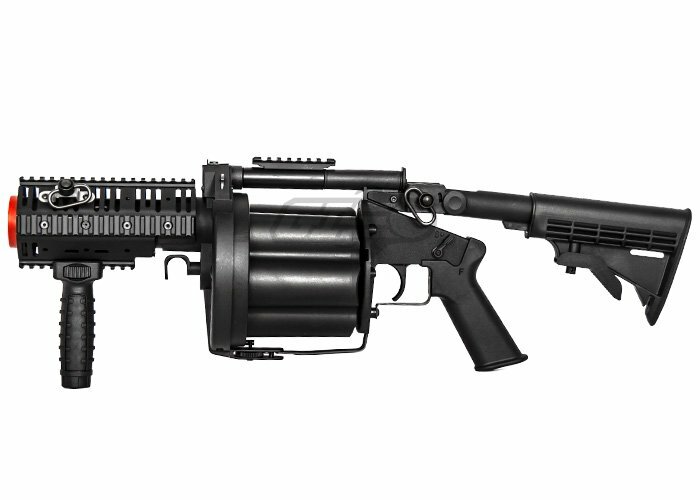 The ICS GLM Full Size Revolving Grenade Launcher is constructed from a high strength polymer and is capable of holding 6 40mm grenade shells. The ICS GLM is constructed out of a high strength polymer to keep weight down while being very durable and shatter resistant. 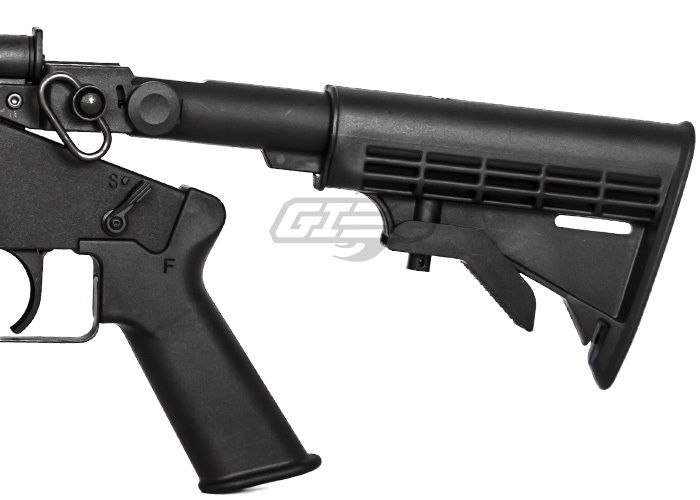 The ICS GLM features a full rail system on the front of the gun which is perfect for a vertical fore grip, light or even a laser, also featured is a top rail for mounting of a red dot optic. 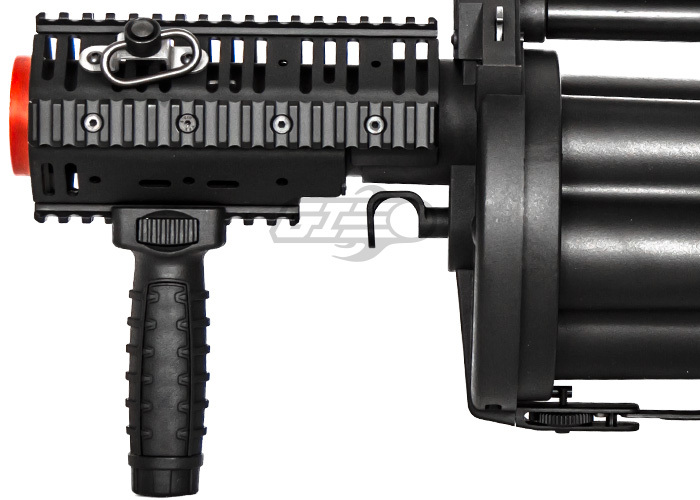 A buffer tube with LE stock is mounted at the back of the launcher which is able to be adjusted to 3 different angles and 6 lengths. Two QD sling swivel points are located at the base of the buffer tube as well as a included rail mounted QD sling point on the railed hand guard of the launcher. A latch under the back of the hand guard is used to open the revolving cylinder and allows quick access to reload your 40mm grenade shells. The revolving mechanism of the ICS GLM is operated by rotating the cylinder counter clock wise and tension can be released via a small lever near the front of the cylinder assembly. 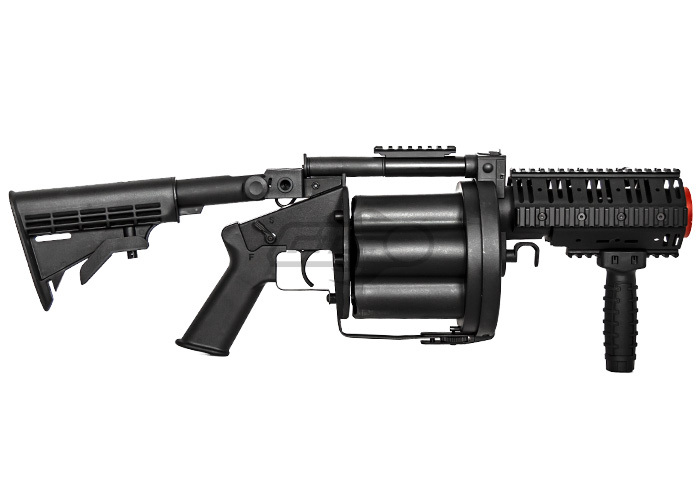 The ICS GLM is the latest in revolving grenade launchers and definitely stands out from the crowd. This launcher is phenomenal for what it is. It gets the job done very well and is amazing for clearing out rooms or field use depending on the type of grenades you use. 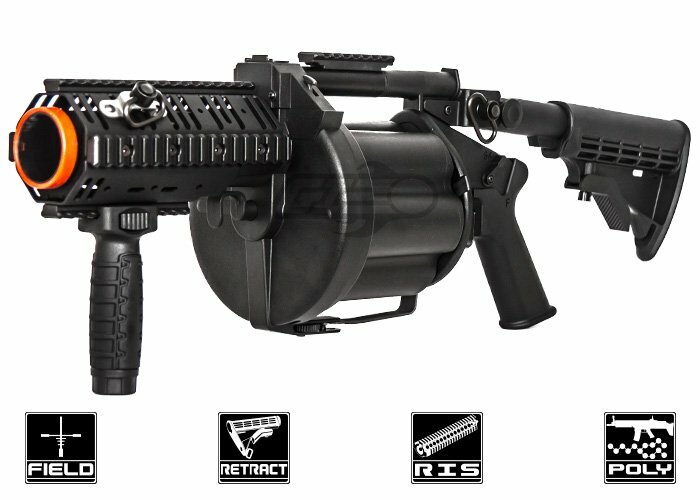 It as as solid as a $159 six barreled launcher is going to get. It's lightweight, and even with 6 Madbull 204 Rd. grenade shells (The biggest shells around), it's still light enough to carry or sling on your back without getting fatigued. The six rotating barrels allow for many different types of shells to be used at a moments notice, and is very nice when you need to blast the enemy mid range on the field, and then switch to a smaller shell for clearing a room. Not to mention, even the reloading process makes you feel like a badass ready to cause some destruction. Every aspect of this launcher just makes it special, which is something you don't usually see in a launcher in my opinion. 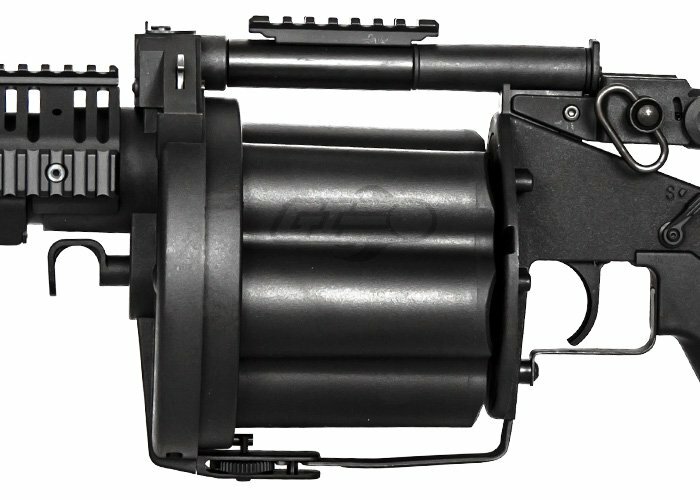 If you're looking for something to just sling on your back, I would opt for the ASG single barreled launcher instead, which has better construction and is part metal, with less moving parts. However, if you play the grenadier role or need this for breaching frequently, get this. You won't be disappointed. Overall, I would highly recommend if you want to instill some fear into the opposition. Seriously, this thing is a beast and is intimidating to the enemy team; they will run in the opposite direction the moment they see it. If nothing else, the intimidation factor is my favorite part of this launcher. This launcher will NOT accept Madbull 204 Rd. grenade shells, as they are slightly too long to fit in the launcher. I had to do some serious modification and shave down the ridges that guide the rotating barrel portion by 1/8th of an inch. The launcher has some personality now, and is a little less solid since the guide ridges are shortened. Reason I did this was because I bought 6 Madbull 204 Rd. shells and wanted to use them in this launcher. It works, but bear in mind, you might wanna take this to a professional to modify this if you want to use them. Even if it works, I don't recommend modifying it, especially since they don't even sell the 204 round shells anymore, and you're probably gonna want this thing to work perfectly at all times as it is. You don't wanna get caught with your pants down in the middle of a breach. Just get smaller shells, you won't need 204 rounds (most of the time) anyways. A little wonky feeling, although it is very good still for a lightweight ABS launcher.